The Harrison and Allen families invite you to stay in their luxurious villa on the Indian Creek Estate, Orlando. The property has five bedrooms and four bathrooms, featuring two master suites, its own private, enclosed pool and jacuzzi/spa and games room. The Indian Creek estate is one of the closest to Walt Disney World (5 minutes drive), whilst also being conveniently located for Universal Studios and Sea World (15 minutes drive) and Orlando International Airport (20 minutes drive). All beds (frames and mattresses) were replaced in August 2017. The villa is fully fenced at the rear, ensuring privacy. - Wall mounted LCD TVs in all 5 bedrooms, with digital channels. Opposite the villa is 'The Oasis', a park with children's play area. There is also a tennis court and basketball court 200m away. The villa has a football/soccer ball, rugby ball, American football, basketball, tennis rackets and balls available to guests at no extra charge. Casa La Jolla is owned by the Harrison and Allen families. We chose to purchase our villa in Indian Creek due to its proximity to Disney World (less than 10 minutes drive to Magic Kingdom car park). Whether its spending time in the pool and spa, playing pool or air hockey, challenging the kids to games on the Xbox 360, watching one of the many DVDs with the family or simply relaxing on the pool deck, there is always something to do at Casa La Jolla. Air conditioning throughout the villa, with ceiling fans in every room. Washer is housed in a separate utility room with the dryer. The dryer is housed in a separate utility room with the washer. Parking for 2 cars on the driveway. The garage is used as the games room, with a pool table and air hockey (both new in December 2018). Bathroom, Beach and kitchen towels all available. High speed broadband WIFI is available free of charge. Seats 6-8 in formal dining area and 6 in informal dining area. We have a selection of books kept in the Games Room. We have a selection of DVDs suitable for all the family. Pool furniture available on the pool deck. Private pool available exclusively for guest use, heated to 86F (if pool/spa heating requested). The pool area is surrounded by a privacy fence. Private jacuzzi/spa in the pool area, heated to 102F (if pool/spa heating requested). The pool area is surrounded by a privacy fence. Totally loved this place - was ideal for the whole family including grown up children, teenagers and grand children. The rooms were very spacious and separated well around the property giving you plenty of peace and quiet when you needed it (I didn't hear my 20 month old granddaughter once through night!). The kitchen was well kitted out with an ice-blender (everyone loves an iced coffee after a hot day in the parks) microwave and decent sized oven - even managed a Sunday roast. From the initial booking onwards everything was very easy and hassle free - you even get reminders for bin day on the VBRO app so everything runs smoothly. Would certainly stay again and as the title review says - felt like home from home for 3 weeks while we were there. Every year we come from all parts of Wisconsin & one of us in Illinois to get together for Christmas on Spring Break. This year we decided to take the 4 smaller kids to Universal. We found this awesome house with a pool, enough beds, bathrooms and lots of space including a game room! Everything we needed was there and the maintenance man was very accommodating anytime we had a question. We made so many memories...the pool was the highlight of the trip...over Universal Studios & the beach(which are all just a drive away). Highly reccomend. This was a very spacious and clean place to stay with my family! The owners were beyond friendly and very accommodating. They even were very considerate to add a bathroom accessory for my sister with special needs. They were very communicable and responded promptly with all the questions we had. We had no problems at all. Good people! 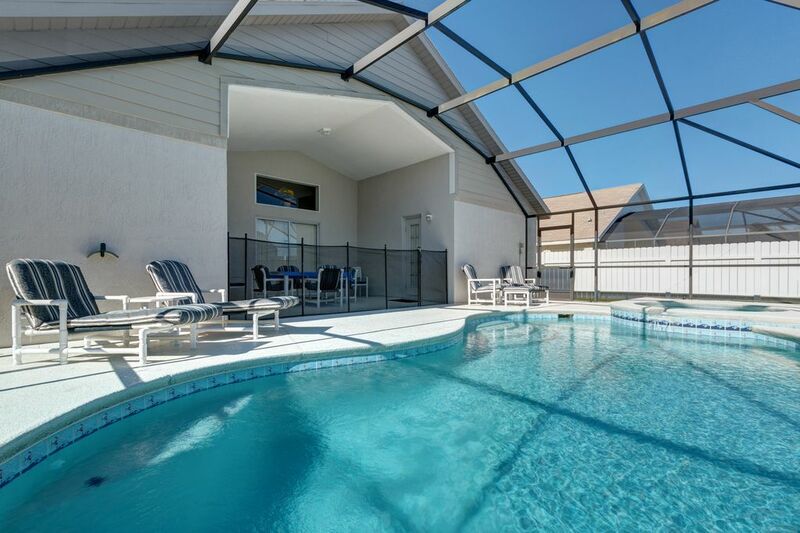 This property is extremely close to Disney and offered a great way to get away at the end of the day. Would rent here again. We had a great visit. The home is conveniently located, clean and well stocked. There was plenty of room for our group. We also enjoyed using the pool, hot tub and game room. All base accommodation rates exclude sales tax of 13.5% and a cleaning fee of $100. For stays of 7 nights or more, a 8% discount applies. Additional discounts are available for all stays of 3 weeks or more, please get in touch for a quote. Pool/spa heating is optional (not included in the rates above). This is charged at a flat rate of $25 per night, payable with the final balance. Taking into account the sales tax, cleaning fee and discount, stays of 7 nights or more are approximately: Low Season - $1,050 per week Mid Season - $1,200 per week High Season - $1,400 per week (this includes Easter) Please note that smoking is NOT permitted anywhere within the villa , nor are any pets allowed. Our Managing Agent is available for emergencies 24 hours per day and general enquiries between 8am and 7pm daily. The initial $300 deposit is non-refundable on all bookings. For cancellations, please refer to our terms and conditions. Dependent on when a booking is cancelled will determine the level of refund.